Of the more than 60,000 graduates of West Point, one has given more back to the institution financially than any other: Mr. Lee R. Anderson Sr. Lee is the single most philanthropic graduate in West Point history. At 6’7” Lee was an outstanding cadet and U.S. Army basketball player. He began his term of service in the Army when he was commissioned in the Corps of Engineers and assigned to Luke Air Force Base in Phoenix, Ariz. He served three years on active duty and quickly achieved the rank of captain. Lee returned home to Minnesota and became a salesman at APi Inc., a small insulation contracting division of Reuben L. Anderson-Cherne, now known as APi Group Inc. Lee's tireless effort and vision for the organization quickly elevated him to president of the company. Using the leadership abilities he learned in the military—loyalty, integrity and hard work—Lee transformed APi from a small business with 13 employees into a multi-billion-dollar enterprise employing nearly 9,000 people. Lee and Penny’s accomplishments include some of the highest honors in business and highlight his dedication to others. As for West Point, Lee is a member of the Thomas Jefferson Society which represents the highest level of giving at West Point. 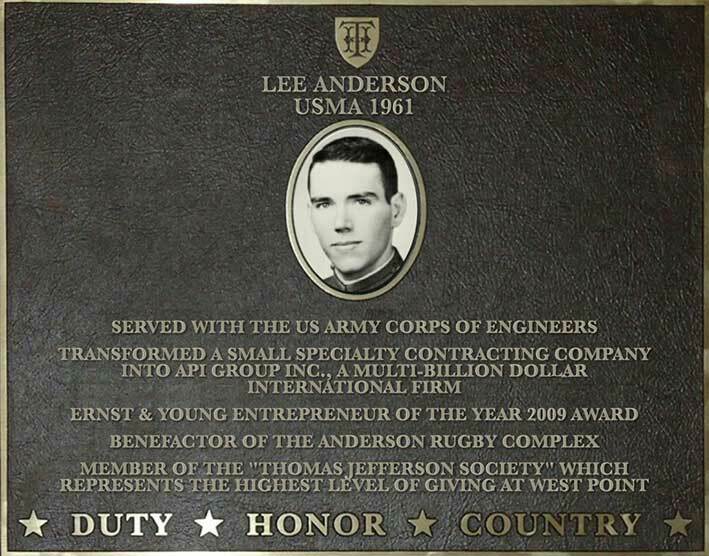 Both Lee and Penny gave a record-breaking $6-million gift to build the West Point Army rugby stadium – appropriately named the Anderson Rugby Complex. In the distinguished history of the Long Gray Line, Lee Anderson stands alone as the leader at the front of the formation as the most generous graduate of all time- a testimony to the leadership lessons he learned as a cadet.